HelloFresh got in touch with me about reviewing one of their boxes. Me of course, being a glutton with no shame, agreed. If you haven't heard of HelloFresh, they're a subscription box service, providing all the ingredients you need to create several meals in one box. I'm a vegetarian, so it's important for me to check with anything like this if a vegetarian option is offered. If not, I generally won't feature it on my blog because, well, I can't really test it. And I want to be honest with you guys about what I really think of the products I write about. Luckily, HelloFresh do offer a vegetarian option. Unfortunately, that's not what I received - but I'm not going to put that on HelloFresh's shoulders as I think it was a miscommunication between me and their representative. If you order directly through their website, I'm certain that you'll get what you order - why would they want to deceive their customers, after all? They also offer a gluten free box (however it does state on their website that they cannot guarantee no cross-contamination, so if you are a coeliac, I wouldn't take the risk), but no vegan box as of yet. This is something I'm sure they're working on, as so many more people are vegan these days - and there are also many people who aren't vegan, but would love to try vegan food! All the ingredients for each recipes were included, minus oil, water and salt and pepper. This is the case for any recipe with HelloFresh, so don't worry about going out shopping beforehand - unless you want dessert. Obviously, each recipe contained meat ingredients, so my boyfriend cooked and ate the meat, whilst I bought vegetarian alternatives for myself. 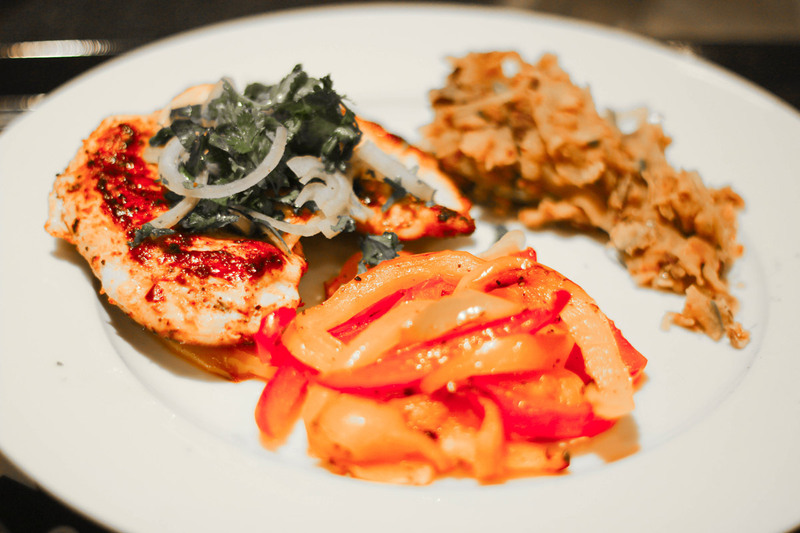 Luckily, there are great chicken, burger and sausage options available in most free-from sections in the supermarket, so I could create these recipes pretty much exactly the same as I would do if I ate meat. The Mexican Style Chicken consisted of chicken (obviously) with a herb and shallot garnish, peppers and refreid beans. I had vegetarian-alternative chicken fillets with mine. This was delicious - it had a little bit of a spicy kick to it, and I'm a sucker for refried beans, so that was a plus for me. The Toulouse Style Sausauges was my favourite meal. 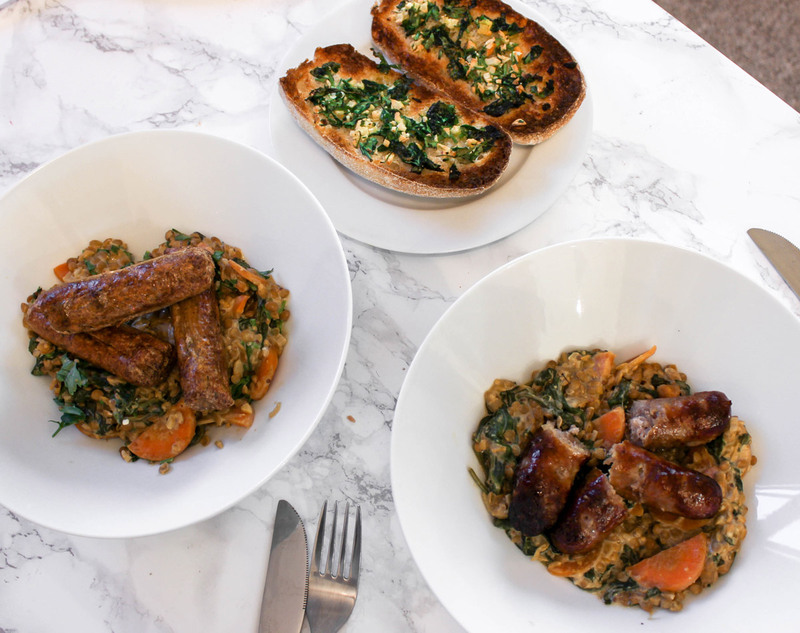 It comprised a base of carrots, lentils and other veg and herbs, with sausages on top. 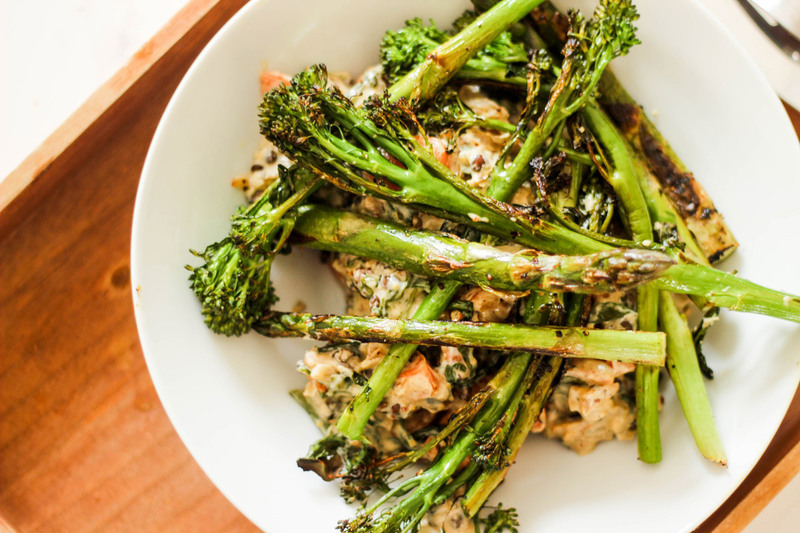 It was filling, healthy and so tasty, that I even recreated it with roasted asparagus and tender stem broccoli the next day, as I was out of veggie sausages (see below). The Herby Burgers were also delicious, but as I'd made burgers before, it wasn't a hugely stand out meal for me. But I definitely still enjoyed it. Potatoes were provided for wedges, and we were even given some mayonnaise as a condiment. We don't have burgers often, so it was a nice treat for us on a Friday night when we just wanted something a bit more 'naughty' - even though they were as healthy as burgers could be, considering they had been made from scratch (well, mine weren't as they were pre-packaged veggie alternatives, again). Before receiving my HelloFresh box, my cooking inspiration had become a little stagnant. I was plating up the same meals over and over again, week after week. This wasn't because I'm not a good cook (I like to think I am, at least), it's because I'm so busy that I don't have time to sit down and research a recipe, then go out and buy all the ingredients for it. I'd rather just cook with what I've got in my cupboard, and rustle up something that I know can't go wrong. With HelloFresh's recipes, I cooked food that I had never cooked before, and even used some ingredients which I had never used in my own food. I loved the easy-to-follow recipes, and would wholeheartedly use them again. I think these boxes are ideal for people, like me, who really don't have time to be creative with their cooking, whether that's because they're a parent, or they've just got a super busy working life - or both! I couldn't find much wrong with HelloFresh, aside from the large amount of plastic packaging involved. Most of the packaging is recyclable - however, I think HelloFresh could work on reducing the volume of plastic regardless. The food arrives in a large cardboard box, with insulated fabric wrapped in plastic to keep the cold in. Inside that is a number of ice blocks in sealed plastic pouches (which are re-usable, but I don't have any freezer space so I had to throw mine away). Each meal is separated into brown paper bags, but the meats, and other things like herbs or condiments, are plastic wrapped. To be honest, unless you buy from a butcher/fishmonger and bring your own tupperware, and compliment that by shopping at the greengrocers and bringing your own bags, it's unlikely that you can carry out a weekly shop without buying something wrapped in plastic. It's a sad fact, and I hope to see it change, but until then I don't think I can complain that buying a HelloFresh box is any worse for the environment than shopping at your local supermarket. Like my content? Follow me on Instagram too!